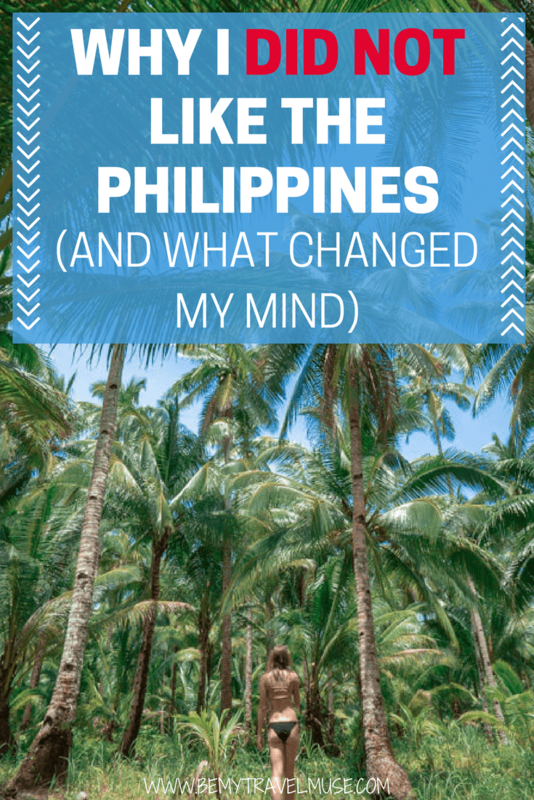 I wrote this post years ago after visiting the Philippines but never had the guts to post it. As travelers, and especially as a travel blogger, I think we often feel like we are supposed to absolutely adore and connect with each place we visit. There has to be some kind of enthusiasm or positive spin on it or else we feel we’ve wasted our time. Additionally, if you really want to offend someone, find something you don’t like about the place where they’re from. It’s their connection to life and who they are. I know, I used to feel the anger well up in me when people would insult the US or Los Angeles (I don’t care anymore – just because it’s their truth doesn’t mean it’s the truth, but it took me a while to get to this point). That’s why I never shared how I felt about the Philippines. It’s a touchy subject, and I wondered, was I really being subjective? Before I made plans to visit the Philippines for the first time in 2013, everyone talked it up so much that I figured it would be my favorite place in Southeast Asia. Yet when I was there, I just didn’t feel it. I kept wondering, what’s wrong with me? Everyone loves it here but I am having problems connecting. On the one hand I can see and appreciate the beauty but on the other I seem to be missing what everyone else is getting when they’re there. Since everyone else seemed to love it and I didn’t, I looked back on that time in my life and travels, reread the blog post I’d written, and realized what the problem was. I’m so glad I didn’t publish that post back then. When I read it, I realized that most of my issues came from my approach. It wasn’t the Philippines, it was me. When I realized that, I knew I had to give it another chance. I first visited the Philippines right after a massive hurricane and an earthquake that devastated several of the islands. I thought it was important to go regardless of this. When I arrived, I found that most people had cancelled their trips to places like Bohol and Coron because of the devastation. I didn’t know how to tell the person who had tagged along for the beginning of my trip that I really didn’t want to travel with him, and I was not in a mood or a place to put out a friendly and outgoing vibe. That always makes all the difference. It’s not the place that makes us fall in love with the journey when it comes down to it, it’s the people. When I landed in Dumaguete, Ferna, a girl I’d met through Instagram, picked me up at 8am from the airport. I didn’t have to ask, she just offered! She and her friend drove me around to some of the hidden spots in Dumaguete until it was time for me to check into my hotel. I couldn’t believe how kind and generous that was of her. I love that Ferna is a fellow solo female traveler smashing stereotypes in her home country by traveling solo in her late 30s. My time with her made me realize how truly generous people in the Philippines can be and set the tone for the rest of my trip. Next on Siquijor, a local named Noel saw me eating alone in his family’s restaurant and asked me how the food was. We got to talking and something about his vibe prompted me to ask if he knew where I could find a shaman. It turned out I’d asked the right person and the rest is history (more in this post). Siquijor really opened my heart. It felt like everyone I came across smiled warmly at me and said hello. Kids excitedly waved and shouted hello to me on their way to school. Even the big and burly security guard at the ferry terminal softened and said, ‘Nice tattoo! I have a geometric one too!’ showing me his sleeve as I passed through. I’ll probably also always remember when I came across a group of off-duty police and they kindly asked if they could take pictures with me, and each one wanted to have his own, plus the group pic. Gotta love these cute interactions. Next on the flight over from Cebu to Siargao, I offered my window seat to a local girl who I could tell really wanted to film out the window with her GoPro. She lit up and excitedly swapped seats with me. Eventually we took selfies together (I seriously don’t know how many selfies I’m in with locals but safe to say almost 100 at this point) and she warmly welcomed me to her country. After that, I met up with another local girl, Arjaylyn, again via Instagram, on Siargao. Get this – she insisted on buying me lunch on HER birthday – I tried to offer to pay but she wasn’t having it. She also saved the day by offering me her motorbike rental which still had a day left on it, which I was able to extend. I’d spent quite a while before we met up trying to locate one and finding them all booked. It wasn’t just these interactions, though, it was also those little momentary smiles while I was passing by, the kids who stuck out their hands for a high-five when I drove by on my scooter, and the people who smiled and asked what my name was, and where I was going. That’s not to say that it was all rosy. There were more catcalls on Siargao than I would have liked, but that just leaves some room for improvement and unfortunately this is a worldwide epidemic. But overall the Philippines turned out to be one of the friendliest places I’d been. I just had to be a friendly person to see it. I’m glad I went back and had a change of heart. All of the things that bothered me before evaporated this time. I can confidently say now that this is a place I’ll return to, excited to explore more and meet more people. Thanks to everyone who welcomed me without knowing how I’d initially felt. You changed my perspective completely! Totally, and not a place everyone likes, either! The Philippines is blessed with awesome beaches and mountains. But what I like most about the Philippines are the people. We recently visited Coron, Palawan and booked a tour package from UltimateCoronExperience.com. They made us feel like we’re a part of the family. Everyone is polite and accommodating. And Ultimate Coron Experience’s team made sure that we’re enjoying every minute of the tour. I loved El Nido & Coron.. Palwan is paradise…the people maybe poor but they’re happy..it was nice to exchange smiles w them on a daily basis..I love the Philiphines and the Filipino people..plus they are awesome singers! I love the “if you want to offend someone, say something you dislike about the place where they’re from.” I thought it’s just me and I’m being too patriotic. I haven’t been to the Phillipines, yet. Every place connects with a traveler differently and we don’t all have the same experience. As a travel blogger I blog about my objective experience whether good or bad. I don’t rosy things up and don’t over-exaggerate either. I try and be as truthful as possible. The Philippines is blessed with awesome beaches and mountains. But what I like most about the Philippines are the people. We recently visited Coron, They made us feel like we’re a part of the family. Everyone is polite and accommodating.